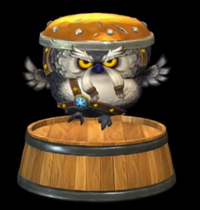 Tuffton are large owl members of the Snomad army in Donkey Kong Country: Tropical Freeze. Tuffton are a tougher version of the Puffton enemy, hence the naming convention. They wear a protective helmet; this protects them from all attacks that aren't Cranky Kong's cane. Aside from its helmet, it serves the same purpose as Puffton; flying in a set area, to be used as a way to get over a gap or abyss. Since jumping on its head doesn't inflict damage, its helmet is essentially a platform. This page was last modified on 2 March 2016, at 20:55.